I wonder how those Western journalists who are mesmerised and duped by the Islamic Republic officials would feel, if they were to receive 74 lashes from the Islamic courts? 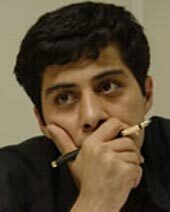 Young Iranian journalist, Massoud Bastani, has been in prison before. Last year, Massoud Bastani refused to ask for a pardon and was imprisoned amongst ordinary criminals in Arak. "Even though living in prison is difficult, but I am not willing to ask for a pardon, for a sin that I have not committed. Freedom is sweet, but its price is more important" Bastani's reply to the offer of a pardon. Now Bastani is waiting for the rest of his senetnce, 74 lashes. His mother has offered to sell all her gold to save her son from this inhumane punishment. His wife is anxious that her husband will not be able to tolerate 74 lashes, and as it has happened before, die under the burden of the Islamic lashes. Its pointless to ask what his crime is? For in the Islamic Republic, punishment is not related to having committed a crime, but related to a refusal of being servile to the authorities and the self appointed representatives of Allah on earth. Yet, it is appropriate to ask where are the Western journalists? Should they not be standing by their colleague? Forums like Open Democracy who see it as appropriate to give known Islamic Republic agents ample platform to disseminate their malicious accusations against Iranian academic, Ramin Jahanbegloo, are silent about a journalist about to receive 74 lashes in the 21St century. Go to news.google and search for Massoud Bastani, there is no news about him. The Western journalists are simply not interested, they rather give a special column to a blogger with obvious ties to the Islamic regime. Thats their democracy. Journalists never come to the defense and aid of their colleagues. When they were being arrested every week during Khatami's time, there was never any outrage from journalists. They're all too interested in their own butts and being able to go into Iran to 'report' in the future. The hell with their colleagues. Western journalist simply dont care about their colleagues in oppressed countries such as Iran or Cuba. Islam as a religion is akin to The Borg – Assimilate or DIE!! !